STANDARD BAND-IT TOOL WITH TENSION ADJUSTMENT & CUT-OFF FOR USE WITH 1/2'', 5/8'' & 3/4'' BAND-IT STAINLESS STEEL BANDING & BUCKELS. 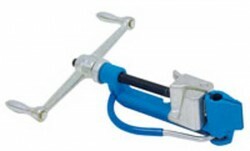 STANDARD TOOL HAS A BLUE BODY, WHILE THE HEAVY DUTY MODEL HAS A BLACK BODY. THE HEAVY DUTY MODEL HAS AN ENLARGED THRUST BEARING AND TENSIONING SHAFT.